Class starts Monday....will you be there? Class starts on Monday! Register today! We all know that people love the presentation of our gifts just as much as they love the actual gifts. How many times have you made a food gift and wished you could give it with something more than just plastic wrap and a quick card taped on top? As someone who has grown up in the good business her whole life, as well owning a professional catering business for 7 years, I have created a unique and original class with my own recipes and packaging ideas. The projects in this class are great for family gatherings, bake sales, holidays or just because....and they're fun to do with the whole family. The "Bake it, Make it & Take it" Online Course will walk you through techniques to create 5 delicious food gifts PLUS the beautiful packaging to make the perfect presentation. From March 22-26, a new "Bake it, Make it & Take it" PDF file will be loaded to the site. You'll use these over and over again AND you'll have some new recipes to add to your collection! * 5 days of techniques and instruction encompassing a total of 5 projects & recipes - including a Mini-Loaf carrier, a See-Thru Stack-it cookie box, a Peek-a-boo muffin bag, a Chocolate Lolli-pop flower pot and a Birthday Cupcake Party-on-the-go. * Full color, step-by-step photos - each day's project will feature photos of every step of the project so that it's easy to understand. 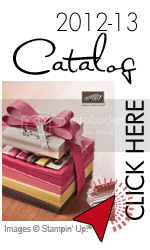 * Full recipes for the baked goods - including printable recipe cards that you can add to your recipe box, as well as decorate and tuck into an envelope and add to your gift. * Extra sample photos of multiple projects - You'll see how different takes on the same project can yield diverse and beautiful results. * PDF files so you can print out the tutorial to keep in a binder to go back to every time you'd like to create these projects again! * Video tutorials to walk you through techniques & baking - You'll get an inside view of my kitchen while I walk you through the recipes in this course, as well as videos showcasing some of the techniques used at my crafting desk. NEW CLASS OPTION: You now have the option to purchase this course as a Tutorial CD! all loaded onto one CD! Tutorial CDs will start mailing March 29th. The "Bake it, Make it & Take it" Online Course will have you creating delicious goodies, creating wonderful smells in the kitchen and give you the perfect gift packaging for your goodies. I look forward to having you in class! Once you've registered, your Paypal receipt is your confirmation for the class. About a week before class starts, you'll receive an invitation granting you special "student only" access to the course site so that you can start getting your "creative groove" on once the class starts on March 22nd! There's still time to register for this class! Read below for more info! Erika - you are the most creative person I've come across! You are continously coming up with new ideas and projects that are absolutely beautiful and appealing to everyone. I love looking at your emails and to see what you have new up your sleeve. I would love to have the opportunity to get selected. I love to stamp, esp. Stampin Up, but have little time and lack a lot of imagination, I am always looking for new ideas. Keep up the great work! It can get expensive purchasing cute little tins to put gifts in. Especially around the holidays when you have a lot of cookies to give as gifts. Anyway....I always know that I can use these little containers for goodies....you all know how much I love to bake. The container that I used from this project was left over from the candy I ate from one of my kids' fundraisers a couple years ago. It's such a great size for cookies! And speaking of cookies....you all know how much I love peanut butter and chocolate together. I used my mom's recipe for her Peanut Butter Blossom Cookies with Hershey's Kisses. 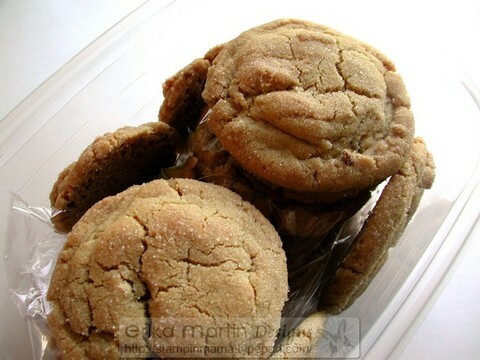 This is my favorite Peanut Butter cookie recipe EVER. It's never dry or crumbly. Not overly sweet....and even though I used natural peanut butter with NO sugar in it, these cookies were still the perfect sweetness! I decided to use this recipe for my Bake it, Make it & Take it post. Oh....and this is a great project to do with your kids or grandkids, or even yourself or a couple of girlfriends this weekend. Or what about next week when the kids have off from school? 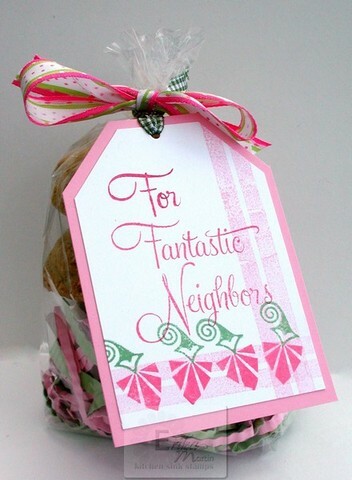 Do you have any elderly neighbors that would love a little visit from you with some cookies to boot? It's a wonderful way to spread some holiday cheer. I covered my tin with paper from the Ski Slope Designer Series pack of paper (Stampin' UP) and then wrapped a piece of the red polka dotted Pure Luxury Holiday Ribbon from GinaK Designs. I used my Coluzzle cutting system to cut a circle of patterned paper to decorate the top of the tin, though you can always substitute this with a holiday bow or a tag if you like. The stamped image on the front of the tin is from Rupa Shevde's set, The Magic of Christmas (from GinaK Designs). I mounted it on top of a striped piece of patterned paper (from the Ski Slope pack). All of the little snowflakes on the side of the tin were done using the same stamp set as the greeting. There's quite a few snowflakes in this set (and I LOVE snowflakes) and I use the three large ones. I inked them up first with Versamark ink and then directly with Riding Hood Red or Baja Breeze (I did 3 of each). I then sprinkled them with Irridescent Ice embossing powder and heat embossed them. I punched them out with the 1 1/4 inch circle punch and mounted them on Riding Hood Red and Blue Bayou cardstock circles that I punched out using the 1 3/8 inch circle punch. I mounted them around the tin with pop-dots. Just one batch of my mom's Peanut Butter Blossom Cookies with Hershey's Kisses makes a TON of cookies, so you have more than enough to hand out to friends and still have plenty to snack on for yourself....or even leave a couple out on a plate with a glass of milk on Christmas Eve. Bake it, Make it & Take it! Bake it, Make it & SEND it! Cookies for Soldiers with Molly Stamps! Last month, my mom (Donna, from Spatulas, Corkscrews & Suitcases) posted that she was looking to recruit a team of people that would bake cookies for soldiers serving in the Middle East. I love to bake so it was a given that I would sign up for her Operation Baking Gals team. And because I love to bake AND papercraft, I knew this would be a perfect opportunity for a Bake it, Make it & Take it post. Rather than "taking it," though, I SENT it! My package just went out in yesterday's mail (a little later than the rest of them when out because we were in PA last weekend for my Soulology Project retreat) and it's on its way to a bunch of hungry soldiers looking for some "lovin' from the oven" back home. I used my mom's Peanut Butter Cookie recipe for one of my batches of cookies. I used super-chunk peanut butter because I LOVE those big chunks of peanuts in my cookies (I made a double batch so we had extra for here at home, too). These cookies turn out SO moist and with a couple of apple peels between the layers of cookies (to keep them fresh) in these plastic containers, they're going to be just as moist when they find their way into the hands of those soldiers. You know me.....I can't just bake something to give away without it being packaged somehow. 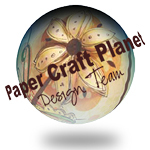 My love of baking follows closely behind my love of papercrafts. Because I needed to make sure that these cookies and goodies were packaged so that they wouldn't break or be all over the box by the time they got to Iraq, I couldn't really put them in cello bags with a belly band around them or something similarly as cute. But.....I thought of a way to decorate the sturdy plastic containers we were encouraged to send them in. I cut a piece of Riding Hood Red cardstock as the base and then cut a piece of patterned paper from the Urban Garden Designer Series Paper pack (Stampin' UP). I chose the paper with the Baja Breeze color theme. I used the Quirky Alphabet set (from Molly Stamps) to stamp out my letters using Versamark ink. 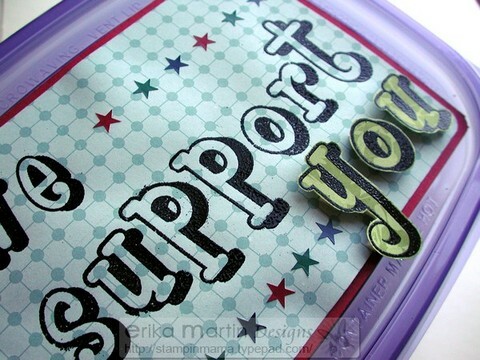 I sprinkled them with black embossing powder and heated them to melt the powder. For the word, "you," I stamped and embossed on a scrap of Kiwi Kiss patterned paper from the Urban Garden pack. I love how these stamps show the patterned paper through the main part of the letter. I cut the Kiwi Kiss letters out and popped them up on the lid using some pop-dots. Just a little extra dimension for fun. I added some red, green and blue star stickers that I've had sitting in my sticker album for YEARS and this was the perfect reason to use them. They went really well with the colors of the cardstock and patterned papers. Cookies weren't the only things I put in my care package. I also tucked in a ziploc bag of 10 stamped cards (because I have SO many of them!) so that the soldiers would have something to use to send home to their own families. Of course, I can't possibly post about making cookies and now show you a pictures of the cookie-goodness that was inside the package. 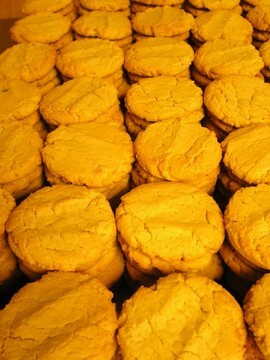 Here's a picture of the Peanut Butter Cookies I sent off. I love rolling the balls of dough in sugar before baking them. In the next couple of weeks, I'll be posting about a team that I'm hoping to put together for my own Operation Baking Gals Team for sending "cookies and cards" to a group of soldiers. This is a great time for doing it since we're all getting into holiday mode and baking up a storm over the next few months. 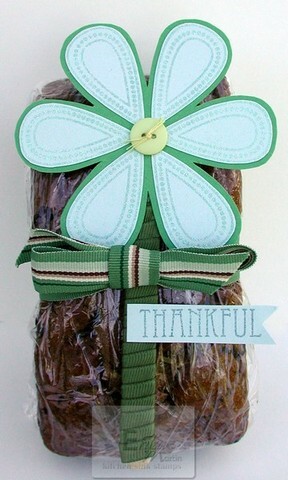 Bake it, Make it & Take it - Zucchini Bread & Interactive Packaging! Hard to believe, but it's been since JUNE that my mom and I teamed up to do a Bake it, Make it & Take it post. I've been saying that I was going to use my zucchinis for a while now to make zucchini bread but there has been so much going on that it didn't get done until yesterday. The great thing about zucchini is that it lasts what seems like forever! We like to team up and do baking and packaging posts. For the BIMITI posts, Mom sends me one of her recipes and I make whatever delectable goody she's sent my way. Then, I create a cute and innovative way to package the goody (but not before I've made a full batch and done complete taste and quality control on it in the form of eating my fill) and then share it here on my blog. For this post, I used my mom's amazing Most Moist and Delicious Zucchini Bread Recipe. If you garden and you're like me, you have a ton of zucchini just waiting to be used. One of the best things about the summer for me is zucchini bread! I can't get enough of it.....and I love mine with chocolate chips in it. Heck, I love just about anything with chocolate chips in it. The recipe that my mom gives makes 6 large loaves, so I cut the recipe in half and made 6 mini loaves. You all know how much I love to bake and show up on the doorsteps of my neighbors. Well, with moving, we have all new neighbors. The house on the other side of us just sold so we'll have new neighbors moving in some time next month and I'll have more people to bring stuff to. My daughter has been baking up a storm, too. It's in her blood. She can't help loving to be in the kitchen. And poker night is every Wednesday night at our house so we bake up a storm for that, too. When we lived at our old place, we had a big veggie garden. Our landlords were really kind about letting us come back and harvest the garden until the season is over. They knew that we put a lot of time, money and energy into it and moving in the middle of the summer is not the best time to leave a garden. We're so thankful that we can still reap the bounty of what we planted there until the garden goes to sleep for the winter season. We only live a mile and a half from where we used to leave and Davy rides his bike to work right past the house every day so he can check in on it and pick from it on his way home. One of the couples that lived at the apartments is helping to take care of the garden and keeping an eye on it. I got a call yesterday telling me that they had harvested all the onions and had cucumbers and zucchinis waiting for us. I stopped in today to pick beans and pick up some of the harvest they'd picked and found that Toby had spent a good portion of yesterday evening weeding! It's been so wet here and we've been so busy that the job of weeding has gone by the wayside for us. What a sweetheart she is! 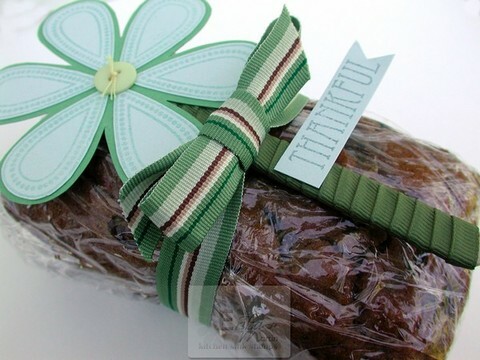 I wrapped up one of the loaves of zucchini bread that I made so that I could have Davy drop it off tomorrow on his way to work. I wanted to do something different for the packaging this time. I wanted to make it "interactive." Whenever I get something that is packaged so creatively, I always feel bad about taking the packaging apart. I often wonder if the people that I give these packaged creations to feel the same way that I do. I decided that I would create packaging for this bread that could be used even after the packaging was taken apart and the bread was long gone. 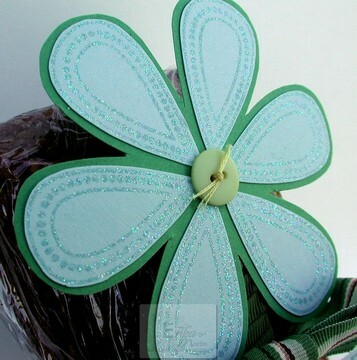 I used a ribbon to tie around the bread but the stamped focal point can be used later on as a book mark or tucked into a little flower pot......and I'm sure that other creative ways to use it could be found, as well. I used the new Pretty Tear Drops set from Kitchen Sink Stamps. I love the brilliance of this set! It can be used to create all sorts of things. Candle flames, flowers, butterflies, dragonflies......the possibilities are endless! I stamped the flower petal six times on a piece of Soft Sky cardstock with Versamark ink and then embossed them with Irridescent Ice embossing powder. I like the tone on tone effect with just a bit of sparkle. I cut each of the petals out and mounted them on a piece of Wild Wasabi cardstock to form a flower shape. I then trimmed the Wasabi cardstock so there was a border around the flower petals. I added a yellow button in the center of the flower. To make the flower into a bookmark, I wrapped a popsicle stick with Always Artichoke grosgrain ribbon. I taped the stick to the back of the flower and then slipped the flower under the ribbon. It's easily removed from under the ribbon wrapped around the bread. I wanted to add a little "thank you" in there somewhere but didn't want to visually overwhelm the packaging so I stamped the word, "Thankful," (from the new Vintage Words set - also from Kitchen Sink Stamps) on Soft Sky cardstock with Bordering Blue ink and cut it out in a thin strip and notched one of the ends to make it look like a paper ribbon. I attached it to the ribbon-covered popsicle stick with a mini-glue dot. I can totally see myself making more of these flowers to use as little gifts, not just attached to a loaf of zucchini bread.......but with all the zucchinis I have right now, I might as well give them a loaf, too! Bake it, Make it & Take it.....Ready for Strawberry Shortcake?? My mom and I realized that it's been WAY to long since my last Bake it, Make it & Take it post. Almost a month, in fact. To be honest, it's been so hot here lately that I haven't really wanted to bake anything. The hot and humid streak we had going on broke last night with a few storm fronts that swept through. If every day could be like today, I'd be in heaven! The perfect temperature, no humidity.....I even sat outside today on my deck to shoot the tutorial I just released today for my Stampin' Mama Tutorial Program. It was so perfect that I felt like turning my oven on because I was in the mood for something no summer can be without. So....what did I bake today? Why, Strawberry Shortcake, of course! With strawberries just coming into season, this is the perfect time for baking up a batch of homemade buttermilk biscuits and serving them up with fresh, juicy strawberries. My mom (Donna, from Spatulas, Suitcases & Corkscrews) created the most amazing buttermilk biscuit recipe EVER. I also love her recipe for fluffy homemade whipped cream (which is so easy to make!). You can check out her recipe here: Strawberry Shortcake. I doubled the recipe and got 24 biscuits...and made sure to buy extra strawberries so that we'd have round two for dessert tomorrow night. (Oh....and for breakfast, I ate a couple biscuits with butter and strawberry jam right after they came out of the oven this morning!) Wednesday night is poker night here at the house with my brother, hubby, brother-in-law and grandfather (and they've even got me playing now!) and I always make sure to have something yummy on hand for dessert. Everyone loved it and I even sent my brother and grandfather home with an extra helping in a little container so they could have a round two of their own tomorrow. When I was thinking about baking these biscuits yesterday, I had planned to bring some over to our neighbors. They're a cute young couple that bring us fresh farm eggs every now and then and I show up with treats on their doorstep when I bake. They brought over some eggs last night and today, I stopped over and handed them the cute package of biscuits you see in this post. I did a couple things different with the recipe so I thought I'd tell you about them before I get into telling you about the packaging. 1) I didn't have any buttermilk on hand so I used 4 teaspoons of lemon juice (for a double batch) to my 1 1/2 cups of regular milk. This sours the milk when you let it stand for about 15 or so minutes and creates your own homemade buttermilk. You couldn't even tell the difference! 2) Because I doubled the recipe and my food processor is rather on the smallish side, I didn't use the food process at all. Instead, I cut my cold butter into more like shavings and then mixed the dough by hand, making sure to rub handfuls of the mixture to break up the butter and shortening into the mixture. 3) I was too lazy roll out the dough onto my counter and make a mess with flour all over the place, so I rolled balls of dough in my hand and then flattened them out a bit to make a round biscuit shape. Much less clean up this way and they still fluffed up very nicely. So....on to the packaging. I couldn't really package up the strawberries (though I'm sure I could have found a way if I wanted to go that far), so I chose to package up just the biscuits and give them to our neighbors with a tag on the front explaining what to do with them. 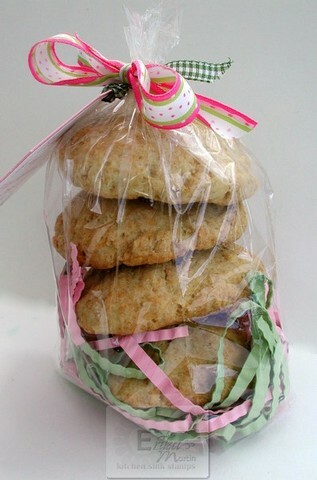 I stacked 4 biscuits in a tall cellophane bag and tied it off with a pretty ribbon. I didn't want the biscuits to just be sitting in the bag without it looking all nice and colorful, so I made my own crinkle grass to go inside the bag. I cut some strips of Pretty in Pink and Certainly Celery and ran them through (three at a time) my crimper tool. I rolled them all together to create a ball and then flattened it out a bit and placed it at the bottom of the bag and stacked the biscuits on top. I love making my own custom made crinkle grass. I never have to worry about having crinkle grass that doesn't match and the paper grass doesn't get all over the place like that plastic grass does. Also, it's a great way to use up those long, thin strips of cardstock that you're hanging onto but don't quite know what to do with. 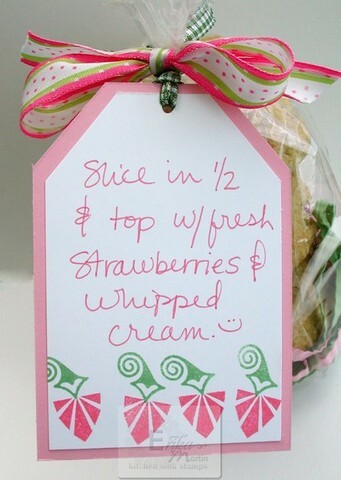 I wanted to create a tag that had some strawberries on it but realized that I don't own not even ONE strawberry stamp! Not one! I started thinking about what I could use to improvise and found exactly what I needed in one of Kitchen Sink Stamps' newest sets. I used the image that looks like a finial from the Plaid Plus set and turned it upside down to make it look like a strawberry (with Regal Rose ink). I then used one of the small swirled accent images in Wild Wasabi to serve as the stem on top of the strawberry. On the front of the tag, I used one of the long plaid-maker images from the set and crossed it in the bottom right corner going vertically and horizontally with Pretty in Pink ink. The new Other Important People stamp set came in VERY handy for the greeting on the tag. Both the words, "fantastic" and "neighbor," came from that set. And because the Whole Family set matches the font used in the Other Important People set, I could use the "For" without it looking like it didn't belong with the other words. I created a border of strawberries on the back of the tag, along with directions on what to do with the biscuits in the bag. The striped/polka-dotted ribbon came from a big box of ribbon that my friend (and muse), Jen, sent me. 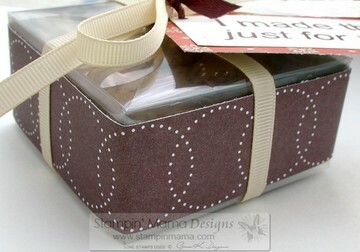 That ribbon is what gave me the inspiration for the colors that I used with this project. I used a piece of Moss gingham ribbon through the hole on the tag and then tied and secured onto the top of the bag. If you wanted to do the whole shebang, you could tuck this cute package of biscuits in a basket with a pint of fresh picked strawberries and a can of whipped cream (since it would be hard to put a tub of homemade whipped cream in the basket). It's a great gift to bring along to a BBQ so that the host and hostess can have it the next night. Writing about all of this makes me hungry for round two tonight! Is it tomorrow yet??? 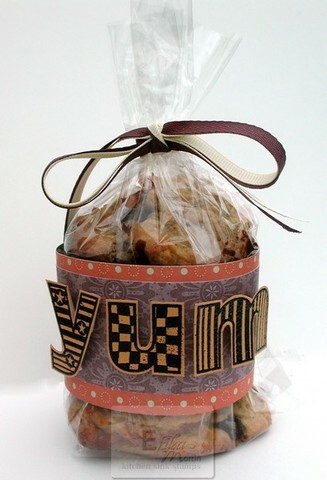 Bake it, Make it & Take it.....Muffins with a Paper lunch bag package! With all the running around I did last week to pick up the doggy, then try to find him a new home, plus having the kids off of school for two days, I didn't get a chance to put up a new Bake it, Make it & Take it Post. In fact, I didn't get much done last week at all.....that's how crazy it was. One thing my dad always taught me is that there's no calories in something if you eat it standing up. Now...whether you choose to believe that or not is entirely up to you. I like to think that if I make my muffins with organic flour and unrefined sugar, I don't have to worry about all the guilt. A muffin is only as guilt-free as you like to think it is. haha! Paper lunch bags have become some of my favorite things to dress up. They're inexpensive and they fun to decorate. I started off with a plain paper lunch bag and cut a few inches off the top. I then folded the top of the bag over about 1 1/4 inches. I trimmed across the edge with a pair of scalloped edge scissors. I used a stamping sponged with Chocolate Chip ink to sponge around the edge of the bag (just on the front side of the bag), along with the flap that I had folded over. I used my circle cutter to cut out a hole in the center of the bag front and then sponged around the hole with Chocolate Chip ink, as well. I have that big box of acetate that my friend, Susan, gave me and this came in really handy for making a window in the hole that I cut. I just applied some adhesive around the square of acetate and then slid it into place and adhered it up against the inside of the bag. I used one of the flower bouquets from the Framed Flowers set (from GinaK Designs) and stamped that around the bag with Chocolate Chip ink. 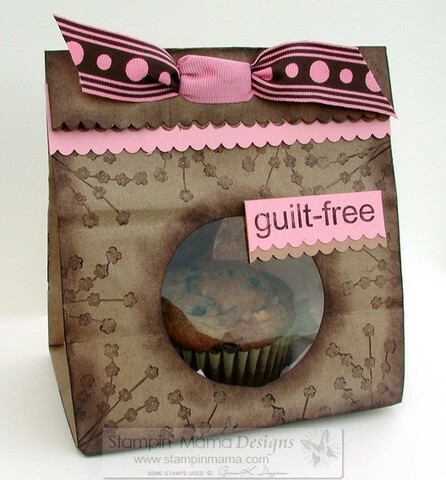 For the "guilt free" image, I used one of the stamps from the What's in Your Tin? set 2 (also from GinaK Designs). 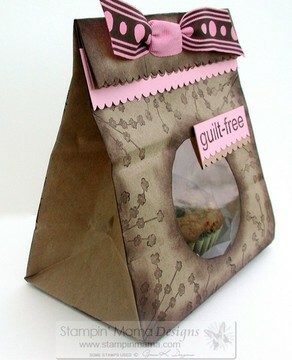 This image actually reads, "guilt-free goodies." 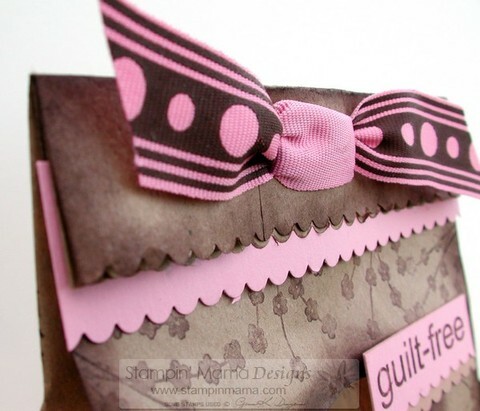 I chose to only use the "guilt-free" so I used my Chocolate Chip Stampin' Write marker to ink up the words I wanted and then stamped it on a scrap piece of Pretty in Pink cardstock. I trimmed the bottom of the cardstock with scalloped edged scissors and then mounted it on a scrap piece of Creamy Caramel cardstock, which I also trimmed with my scalloped scissors. When I put the muffin inside the bag, I set it on top of a crumpled up piece of white tissue paper just to give it some filler inside the bag. I also placed a piece of waxed paper underneath just in case the bottom of the muffin cup was a little greasy. I didn't want there to be grease spots on the bottom of the bag. I trimmed along the edge of a piece of Pretty in Pink cardstock with my scalloped edged scissors and then lined it up against the edge of the bag top so that the scallops lined up. I made it a bit longer so that I could trim the sides after I'd adhered it. I fold the bag top down and then punched a couple of holes with the rectangle hand punch (I punched one on top of the other so that it made a longer slot) and then threaded a length of brown and pink ribbon through the front of the bag. I crossed the ends on the back side of the bag and then ran then ends back through the holes. This created a "faux bow." I trimmed my edges and adjusted them a little so that they laid flat across the flap of the bag. This bag didn't take much time at all and the cardstock that I used on it were all scrap pieces. This packaging probably cost me all of 10 cents to make! Talk about quick and cost effective, but attractive packaging! 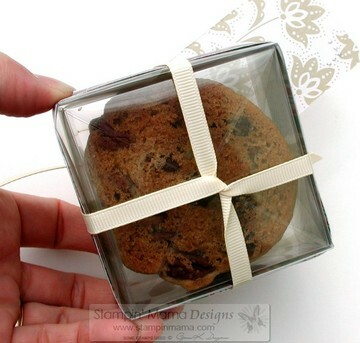 Bake it, Make it & Take it.....Cookies in a see-through box! Wow......the week in between last week's Bake it, Make it & Take it post and this week's seemed to fly by! I certainly don't mind baking another round of sweet goodies in my kitchen, though. You'll never hear me complain about that! For this week's BIMITI post, my mom (Donna, from Spatulas, Corkscrews & Suitcases) gave me her fabulous recipe for White Chocolate Macadamia Cookies. Now, before I begin telling you all about this project, I'm going to admit (confess??) a couple of things. 1) I've never been a fan of white chocolate. I know a lot of people LOVE white chocolate, but I have tried and tried, since I was a kid, to like it but I just can't. It's like a food item that wants so badly to be chocolate, it strives to be like chocolate, it even calls itself "chocolate" but it will never be chocolate. I feel like a traitor to real chocolate if I eat white chocolate. But besides that, I've never really "acquired the taste" for white chocolate. 2) I love my mom's recipe, but seeing that I don't care much for white chocolate, I tweaked the recipe to suit my tastes. First off, I cut the recipe in half. As much as I love cookies and as much as I thought I would lose weight with my mom living on her boat 5 hours away and not giving me tons of yummy treats to eat, I STILL find myself getting a bit tight in the waistband. I knew that if I made a WHOLE batch, I'd eat all of them! haha! Instead of doing white chocolate, I poured an entire bag of semi-sweet chocolate chips into the batch and I substituted chopped pecans for the macadamia nuts. 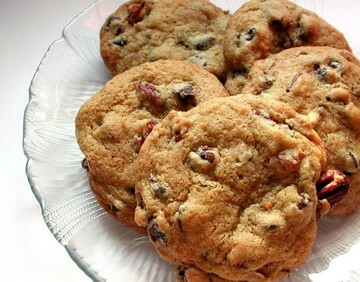 I've had a hankering for pecans (I only like them in baked goods, never raw.....wow, I'm picky!) so I threw in a whole bag of those, as well. So, now that I've gotten my confessions out of the way, it's on to telling you all about my snazzy little see-through box that I made for these cookies. By the way, my mom's recipe is one of the butteriest tasting cookie recipes you'll ever try! They just melt in your mouth! Now, the wheels in my head are turning a mile a minute coming up with all sorts of fascinating and brilliant ideas on how to use these sheets. A small part of me feels that "hoarding instinct" kick in and makes me want to put the box away under lock and key, but I'm breaking free from that! haha! For this box, I used a basic origami box design. One of the things that I do differently with my boxes is that I don't fold corner to corner like it shows in the directions. When you do that, you get two cross-ways creases on the flat part of the box. What I do is find the center point of the paper with a rule and draw an "X" in the center. I use that as my center point to fold my corners in to. With a transparency, you can't really do that, so I used a marker that would wipe off of the transparency and put a dot in the center point (which I found with a ruler) and used that dot to fold my corners into. This way, you avoid having creases on your box top. You especially don't want them on a transparency box top because it would really show and "peak" up on the creases. I cut my box bottom at 8 x 8 inches and my box top was cut just a bit larger, at 8 1/4 x 8 1/4 inches. I know that the Apple Cider Designer Series paper is retired, but I just can't help myself from using it when it comes to packages with cookies in them. The colors seem to go so well with chocolate chips. I cut a strip at 12 inches long and adhered it around the sides of the box top. It was just long enough to reach all the way around and overlap slightly at the ends. Because I used double-sided paper, I didn't end up with a boring white border showing through the inside of the box. I got a second pattern on the inside! How cool is that? Sometimes I feel like I'm wasting paper if I'm covering up an equally awesome pattern when I adhere it to a card. At least with this little box, I get to see BOTH sides of the paper! Yes, I'm easily amused! *wink* Honestly, it doesn't really take much. I didn't go overboard with decorating my box because I didn't want to cover up those beautiful cookies inside. I was able to fit two cookies in the box, though you could start with a larger sized piece of paper if you wanted to fit a few more cookies in there. I tied a length of Very Vanilla grosgrain ribbon around the box and crossed over it on the bottom and then tied a big bow on top. I trimmed the ends of my ribbon on an angle for a nice, clean look. I made a tag to go on top of my box.....and in the top picture of this post, the angle of the picture makes the tag look HUGE, but it's not really that huge! I stamped the words "I made this just for you," (from the What's in your Tin 1 set from GinaK Designs) on to a piece of Very Vanilla cardstock. 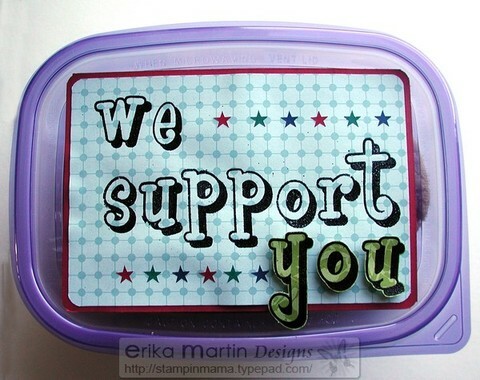 To get the different colored words, I colored directly onto the rubber stamp with Chocolate Chip and Really Rust Stampin' Write Markers (from Stampin' UP). Those brush tip markers work fantastically on rubber! I rounded opposite corners with a corner rounder punch and did the same thing with a larger piece of patterned paper from the Apple Cider pack. I used my paper piercing tool, template and mat (from the Crafters' Tool Kit) to pierce some holes in the corners of the cardstock for some visual interest. I then mounted the greeting on top of the patterned paper, then punched a hole in the top left corner with my 1/8 inch hole punch. I threaded a piece of the new Chocolate Chip (see? that color was MEANT for projects with cookies!) Poly-Twill ribbon (found in the Occasions Mini Catalog) through the hole and then tied that in a double knot over the center of the knot on the Very Vanilla grosgrain bow. Don't those cookies look amazing? Yes, I had one for breakfast, complete with a cup of chai to wash it down. Like my dad would call it, "The breakfast of champions!" Champion of what, I'm not sure, but it sure was YUMMY! This post is well over-due.......it's been a while since I've done my last Bake It, Make It & Take It post. So.....on to my post about these amazing cookies. This peanut butter cookie recipe actually belonged to my Great-Grandmother Doris Thompson and then she passed it on to my grandmother, Beth. My parents used to make these cookies when they had their bakery/cafe. They're not overly sweet.....they're just perfect. When I was trying to figure out how to package these, all that kept coming to mind was stacking them in a tall cellophane bag with a belly-band, so that's what I went with. I stacked my cookies in a tall cellophane bag and tied it up with a length each of Very Vanilla grosgrain ribbon and the new Chocolate Chip Poly-Twill ribbon from the Occasions Mini Catalog (it's also available in Old Olive). To create the belly-band to put around the package, I cut 2 strips of patterned paper (one a tad wider than the other) from the Apple Cider Designer Series paper pack (now retired) because I liked the muted warm earth tones......they reminded me of peanut butter and chocolate. I adhered one on top of the other and then wrapped them around the package, securing the ends with Sticky Strip (aka: Red-line tape). 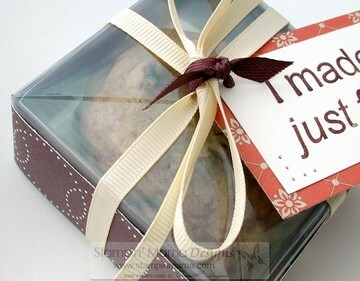 For a simple stamped greeting, I chose the word that came to mind: YUM - Talk about simple and to the point! I used the Playful Alphabet set from Kitchen Sink Stamps to stamp the letters on a scrap piece of More Mustard cardstock with Versamark ink. I sprinkled them with Black embossing powder and then heated them up. I cut them out, leaving a small border of More Mustard cardstock around the edges of the letters. I mounted the letters over the front of my belly-band with pop-dots for some fun dimension. 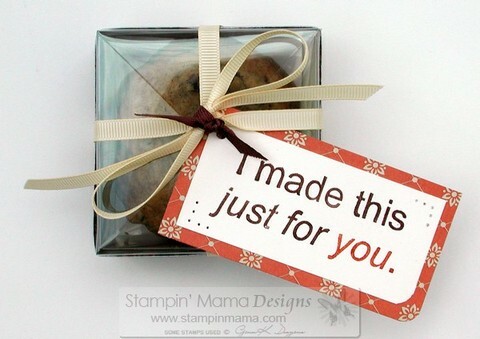 It doesn't have to take a long time or take a lot of "stuff" to dress up a package of baked goodies. 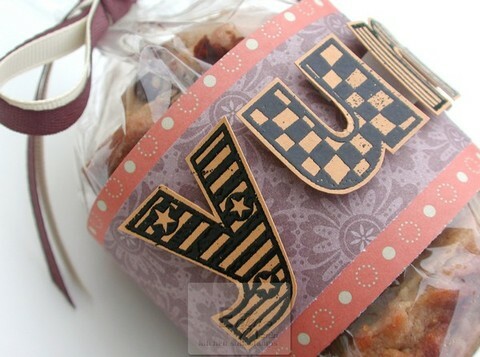 A belly-band is a really easy way to make your baked gifts look fun and tempting. I've already eaten my share of those amazing The Best Peanut Butter Cookies so as much as I want to dig into that pretty package and eat them all myself, I DO have plans to pass this little bag of goodies on. I'm going to be bringing them to the girls that work at our little town post office. They love baked goodies and they're always looking out for me. The postmaster even passes on her insect and bird books on to Zach, has caught and held bugs for him until I go in to get my mail and always has a candy dish out for the kids. I love living in a small town. The cookies will be a good way to show my appreciation to them. Don't forget to enter my mom's Cookbook Give-Away!